iSimulate: Fiber Toolkit is a new, feature-rich, user-friendly, cross-platform application for simulating and visualising light-matter interaction and pulse propagation in nonlinear fibre optic problems. 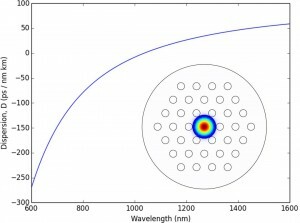 The project is currently under development by myself and my colleague, Edmund Kelleher, in the Femtosecond Optics Group, Imperial College London. Optimised numerical algorithms are coupled with rich two- and three-dimensional visualisation to enable quick and easy exploration of how light interacts in optical fibre. Computation of step-index fibres and photonic crystal fibres (PCF) by solving the characteristic eigenmode equations (using a vectorial effective index method for PCF). Pulse propagation along fibre by solving the generalized nonlinear Schrödinger equation. Simulation of chirped and apodized fibre Bragg gratings by solving coupled wave equations. Visualisation including: optical spectrum and pulse shape; temporal and spectral phase; opitcal spectrogram; autocorrelation function; and evolution plots showing how these quantities vary with distance along the fibre length. In addition to computing fibre properties and exploring optical propagation in fibre, future releases of iSimulate: Fiber Toolkit will offer numerical models of other common fibre components, for example fibre amplifiers, and will enable full simulation of fibre lasers and other fibre-based devices and systems. iSimulate: Fiber Toolkit is suitable for solving numerous problems, from pulse compression to supercontinuum generation, and intended to benefit a variety of users: as an educational tool to explore nonlinear effects in fibre; as a means of producing publication-quality simulations to support research work, or as a design guide for industry. We hope to release this soon; please check back later for updates. Application GUI showing supercontinuum generation simulation [Dudley, Genty and Coen, Rev. Mod. Phys. 78, 1135 (2006)]. The slider control enables real-time visualisation of pulse propagation and supercontinuum evolution. 3D mode profiles of supported linearly polarised (LP) modes in SMF28 (standard telecommunications fibre) at 600 nm. 3D spectrogram showing an N=50 soliton propagating in a 10 m length of highly nonlinear fibre.